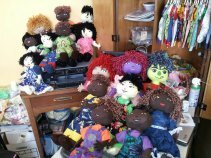 The Doll Charity is a gathering of creative people who sew, stuff, and create stuffed dolls to give to the Police Departments to give to children who are being removed from their homes in order to calm and comfort them in a time of confusion and fear. 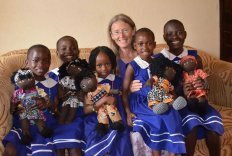 Recently we have also given dolls to children in Arizona, Uganda, Mexico, Cuba, India and Haiti. The Sew Pro's stores have been kind enough to allow us to meet and make our dolls in their stores. That way we have access to Sewing Machines and we can keep all of our supplies in one place. Anyone who would like to make a doll can come and stuff or sew or learn to glue hair. You don’t need to know how to sew! There’s a project for YOU! We are always grateful for solid color doe suede or polar fleece. We can also use Velcro, elastic and stuffing. 1,600 dolls delivered since 2009! Thank You Volunteers for Sewing with your Heart!